The property offers 35 luxury rooms and suites. And Henderson Park Inn’s on site check in, which is available 24 hours a day, allows us the leisure of getting here on our own time. Opening the door to our Corner Suite—with a real key verses the modern, digitized plastic—we are welcomed by a tray on the bed with a bottle of wine, fresh fruit and flowers. The room also boasts a panoramic view of the amazing sunset. From the view through the French doors opening to the beach balcony, the sunset wraps around the room through windows on the park side view. Our balcony allows us to be steps from the white sand of the Gulf of Mexico. The suite also has a whirlpool tub, free high speed Internet, a kitchenette with complimentary bottled water, microwave, coffee maker with gourmet coffees, and turn down service. The all-inclusive stay provides everything but dinner at the property’s waterfront, fine dining, Beach Walk Cafe. A breakfast buffet comes complete with chefs who, greet us by name and prepare eggs, omelets and Belgium waffles. There are also selections of fresh fruit, cheeses, biscuits, gravy, grits, bacon and sausages. Each day we order our complimentary gourmet picnic lunch for the following day that we take to the beach with us. And upon our check out this lunch becomes a car picnic, allowing us to drive straight home. I highly recommend the chicken salad sandwich as a lunch option. Huge and delicious chunks of chicken breast, lettuce and tomato overfills the whole grain bread, packed with chips and pickle spear. Other tempting lunchbox options include ham, turkey, prime roast beef, Mediterranean veggie, tuna salad chicken breast and grilled chicken Caesar salad. And at sunset each day there is a complimentary happy hour for guests at the Tiki Bar and deck. Even when we are off property during the day we make every effort not to miss this drink with a view event. Henderson Park Inn also has a complimentary community fridge packed with soft drinks, water, candy and more. And cookies, lemonade, fruit and tea are provided as an afternoon snack. 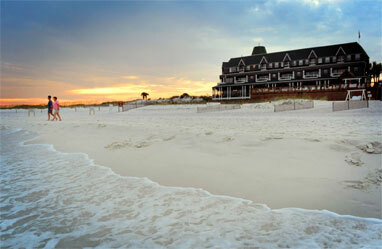 The Inn also provides beach chairs, umbrellas and beach towels for use on-site. And bicycles, complete with helmets and chain locks are available upon request, along with a map of suggested biking and jogging routes. For those not traveling by car, there is a complimentary shuttle service—to and from Northwest Florida Regional Airport—during the months of March through October. For four romantic days we enjoy quiet mornings made for sleeping in—with only the sound being the waves coming ashore—before breakfasting on made to order omelets. We take walks along the private beach, searching for seashells. Take beach towels, wine and our lunch boxes to the beach for leisurely picnic lunches. We watch the sun set over happy hour at the Tiki Bar. And we linger over delicious dinners at Beachwalk Cafe, during the evenings. The award winning, Beach Walk Cafe is located on property in the main building, in the same space where breakfast is served. We toast our last evening here at the Inn with a bottle of Schramsberg Brut, North Coast 2011. Dinner begins with pan roasted Jumbo Lump Crab Cake. The cake arrives hot above a bed of corn and scallion griddlecakes with lemon aioli and organic baby arugula. We select Grouper Venice and Ribeye Cap as entrees. The large piece of succulent, pecan crusted, local grouper was oven roasted and presented atop a scrumptious, mashed potato cake and lovely to the last morsel. What is a ribeye cap? Also known as a deckle steak, calotte or spinalis dorsi, this is the small cap that surrounds the center of the ribeye. This highly desirable cut is prized by chefs and butchers. The char grilled, delicate cut of beef has the tenderness of a tenderloin, marbling of a ribeye, and flavor beyond compare. It is served with a creamy scoop of garlic mashed potatoes and gorgeous, baby carrots that are busting with fresh flavor. The dessert menu tempts with a cheesecake and chocolate of the day. But we opt for sharing Key Lime Pie. Our large slice has homemade cream topping with a lime atop, on a plate that is drizzled with raspberry sauce and accompanied by sliced strawberry. Compliments to Beach Walk Cafe's executive chef, John Sallman, who executed this excellent meal. Sallman’s cuisine along with the restaurant’s superb service and magnificent view makes Beachwalk Cafe a destination restaurant for foodies, who are staying at the Inn and those who are not. For special occasions or a meal you will never forget, reserve Beach Walk Cafe’s “Toes in the Sand” table on the beach—with a private table along the shore. Tonight as we return to our own private deck, our final sunset includes a view of a couple getting engaged over dinner on the beach. A rose petal path leads them to their table. Then with Champagne they toast and take a walk. The man leads his soon to be fiancé to a place where he has buried her ring in a treasure box in the sand—most romantic thing I have ever witnessed. He then proposes on bended knee. She obviously says, “Yes” because they embrace and kiss before returning to their table for dinner beach side. Henderson Park Inn also hosts weddings and is an ideal honeymoon location. History of the Inn Originally constructed in 1991 by the Abbotts, local developers with a love of New England architecture, the Inn was designed to bring a little Northeastern Atlantic charm to the Gulf Coast area of Northwest Florida. Hurricanes have come, done damage to the Inn—even closed the Inn—and gone. And when the Inn reopened for business in 2006, the Inn’s original manager, Jim Olin’s oldest son Ryan was named as the new Innkeeper and still keeps daily watch on the Inn today. Times have changed, operation methods are a little different, but a heart for making the Inn a special place for every guest was passed from father to son, and Ryan continues the tradition of guest care that his father instilled. And McCabe Olin, Ryan’s son, has already started making friends at the Inn, getting ready for his reign of succession to come. Henderson Park Inn’s history and recipes can be further explored in a copy of their book, Exceptional Taste, Tales and Recipes, found in each guestroom and available for purchase at the front desk. Through my lifetime I have been to Destin more times than I can recall, for both business and pleasure. I have watched it evolve through the decades. And while all the trips were enjoyable, none stands alone as does this one. With no children, no pets, and no condo fridge to fill, Henderson Park Inn offers an adult oriented piece of Destin for those who desire privacy and romantic sunsets.